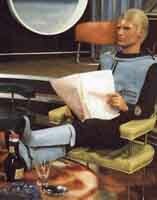 Unlike Anderson's previous productions, Captain Scarlet and the Mysterons attempted to make the puppet characters "real" rather than caricatures. Just as important, there would also be a more serious tone to the new show which was in keeping with the programme's heightened realism. The premise for Captain Scarlet is also more complex than in previous Anderson productions with the cataclysmic mistake by Captain Black ofattacking the Mysteron base throwing humanity into an inter-planetary war. But the odds are far from equal. On one side, an invisible enemy with their seemingly supernatural power to raise the dead, on the other, the all-too frail human aggressors. But thanks to a Mysteron blunder, Earth has a secret weapon in the form of Captain Scarlet - a Mysteron duplicate who regains his humanity while retaining the Martian's power of retro-metabolism - the ability survive seemingly certain death. Barring all but the most extreme circumstances Captain Scarlet is indestructible. The Mysteron's replacements were originally conceived as robots but it was felt that this would make it difficult for audiences to relate to Captain Scarlet after slipping out from under his alien control. It was also clear early on in pre-production that the new puppets were not quite as human as had been expected and that making them move realistically on screen was harder than ever. As a result, much of the show looks very static as even minor movements, especially walking, made the puppet characters appear very wobbly. "I still wonder about the wisdom of our decision to change the puppets," explained Gerry Anderson many years later. "The heads were reduced in size to make them in proportion with the rest of their bodies, but the problem was that exact and precise movements became even more vital than ever and that caused us terrible difficulties." The fight against the Mysteron's "war of nerves" is masterminded by Spectrum although it is never made clear what the organisation's role was before the onset of the alien threat. However, what is certain is that it is an international and highly secretive force with extensive resources around the world that answers directly to the World President and that celebrates its first year of operation in Flight to Atlantica with Mysteronised champagne. The show has a good many strengths, principally its strong designs and excellent special effects. However, continuity is shaky (which was not helped by the randomised transmission order) and the lack of any humour often makes it a dry offering. This is further compounded by some very weak characterisation with the Spectrum team of Captains never gaining the recognisable individuality of the Tracy brothers. As Tony Barwick, the show's script editor admits: "There was no deep characterisation." The 30 minute format also hampers the story telling with complex plots being forced into an episode length that all too often cannot contain them. As a result, subplots are rare which results in a linear narrative style. That said, the Mysteron rings, the hidden SPVs, the disembodied Mysteron voice and Cloudbase (a flying Tracy island?) are all highly memorable. It's just a shame that so many other elements within Captain Scarlet and the Mysterons fail to live up to their promise. "I think it was really formalised writing," explained Barwick. "You have the hero figure, Captain Scarlet, and then you have the coloured guy, Lieutenant Green. You've got Colonel White, who's the head guy, very authoritative, Captain Blue's the foil, the nice guy, and then the girls, the Angels, are from all sorts of backgrounds: one's oriental, one's English, one's American, and so on. It was all par to the American market and to that extent there was no deep characterisation." If only the show had lived up to the ITC press information booklet: "Remarkable new techniques are used to bring vivid realism to the animated Supermarionation figures and to the fast-moving action, with a depth never achieved in this fascinating sphere of film production. "The show's lacklustre feel is undoubtedly the result of many factors. 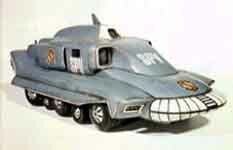 However, an overall lack of control may have contributed more than most to Captain Scarlet's failure to fulfil its press hype. "We were making Thunderbird 6 at the same time as Captain Scarlet and it is in my nature that if the left hand side of the studio is working on a television series and the right hand side is working on a feature film, then that is where my heart would have been," explained Anderson. "Consequently, I wasn't as closely involved in Scarlet as I might otherwise have been."